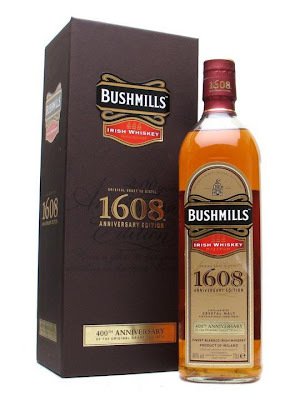 Bushmills 1608 400th Anniversary (46.0%): 1608 is a limited edition whiskey released as a distillery only product to celebrate the 400th anniversary of Bushmill's licence in 2008. It has ben made available in travel retail as of 2009. It is a high malt content blend distilled partially using "crystal malt". What it means is the malt is given a final stream of very hot air at the end of its drying process so it gets a crystal like appearance. It is a method usually used in beer making process to add some sweetness to the brew. We will see what it does to whiskey... Another amazing gift from friends on their way back from Ireland. Color: Dark amber with a red hue, almost like a rooibos tea. Nose: Nectarine and peach aromas jump out of the glass. Vanilla and orange blossom honey. Warm East European fruit bread, rose petals and dried sour cherries. A few drops of water helps blending everything nicely together and also adds some cheese brine and old, decayed leather furniture aromas. Palate: Definitely Bushmills in the core, very spicy and awakening. Sweet in front, hot and bitter at the back of the tongue. Adding water takes both extremes out and mellows the spirit. The Scandinavian mulled wine Glogg: with cardamom, star aniseed, cloves, cinnamon sticks, honey rock candies and toasted wood. Dark and thick sherry notes, peach melba, ripe raspberries and ripe brown Turkey figs. Finish: Long and seriously hot without water... Woody, peppery and spicy notes ride together. Peach is making a great attempt to be back with burnt sugar. Overall: A special whiskey with a unique personality. More like a blend of Bushmills Black Bush and 21yo. Not exactly what I would call a balanced whiskey but it is an enjoyable ride indeed. Spicy and sweet at the same time with some extremes here and there. Great winter dram... Would be a great holiday season digestif, maybe with a nice mellow cigar to accompany... I'll keep that bottle for colder days. 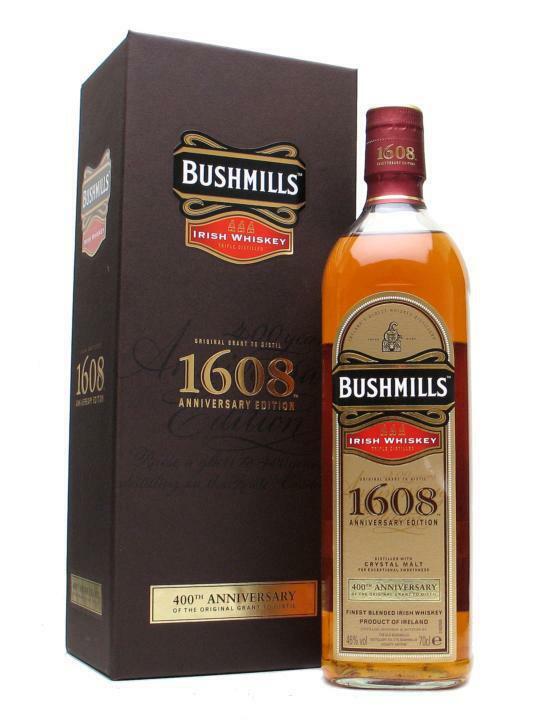 Definitely worth to give it a try if you like Bushmills.